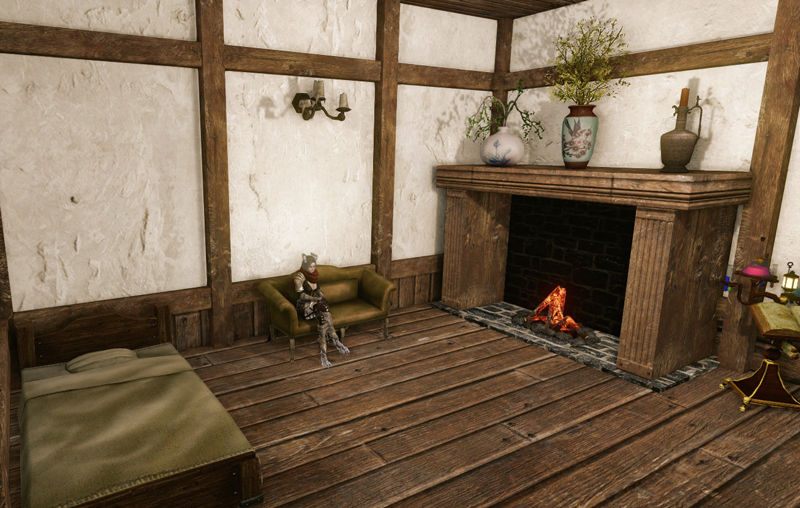 I haven’t had a chance to detail my recent adventures in ArcheAge now that I have completed my first goal of building a farmhouse. I spent a lot of time over the past weekend experimenting and figuring out what I needed to grow and raise to do things like complete the farmer workbench daily quest and trade runs in my area. I also learned about aqua farming, attempted fishing for the first time and completed my harpoon clipper. As of yesterday, I’m level 49. Most of my leveling came from farming and fishing over the past few days. I did take some time out to complete most of the quests in Ynystere. Now that this content is much, much lower level than I am, it didn’t give a lot of experience. I mostly cleared it just to tie up loose ends and get questing items out of my inventory. My gear is still woefully underleveled, which is a situation I’m trying to figure out how to remedy. I’m not keen on what I’ve been hearing about the end game weapon grinds. Crafting may be a possibility, but I know it’ll be expensive, and I don’t know if it’ll be worth it in the long run. Still, the things I enjoy doing in game don’t really require nice gear, so that’s not my area of focus right now. I decided to try out aqua farming last weekend, and purchased the aqua farm blueprint for 20 gilda. The nice thing about this blueprint is that it requires no resources or labor to place. Just the tax certs. If you look on the map, aqua farm areas are noted as blue smiley faces just off the shore. I had no issues finding a decent spot to place mine, and got to farming quickly. Aqua farms are each equip with an air supply that you can tap into while you’re underwater planting. It’s slightly annoying to have to stop every so many plants just to make sure you don’t drown, but it comes with the territory. You can use someone else’s aqua farm for air, too. You’re mostly growing things like oysters and coral on an aqua farm. Theses are items important to alchemy, handiwork and other crafting classes. Each coral was fairly pricey to plant, and depending on the color, had different maturation rates. I planted red coral and was able to sell for a profit, but it wasn’t in demand as much as lumber, cotton or more normal farm items. I went back and forth on whether I wanted to branch out into aqua farming permanently. I decided that while it’s a neat concept, it just wasn’t for me. The aqua farm was zones away from any of my other farms, and the time it took to travel around could have been used for something more profitable. It was harder to sell the produce at this point, and while it may be more in demand later, I chose to focus on my two farms, which are more than enough for me. So I sold the farm design and didn’t take much of a loss on it. It helped make up the gold I burned through to finish building my farmhouse. Any game that has fishing will always find me fishing. While I’ve had a pole and some worms, earned from a quest, I’ve been waiting until I had the time to actually attempt it. There’s two kinds of fishing in AA – the kind that requires worms (which are expensive unless you can generate them yourself through planting seed bundles), and the kind that requires lures (which you purchase using vocation badges). I have tons of vocation badges stored up, so I bought some lures and went out to explore. You can fish with worms from any watery location. This is sometimes called AFK fishing because once you start fishing, your character just goes at it, burning through your stack of worms at 5 LP each cast. These fish aren’t worth much to vendor, but they can be used in crafting. Sport fishing is a different story. Someone has to work a school of fish into a frenzy by using a chum of some sort — an item also purchased with vocation badges. I’ve never had to chum the water, though, since I’ve always just come to someone else’s fishing spot after they’ve activated it. Chumming creates a buff that everyone in the area can take part of. While the buff lasts, you can cast with lures to do the real fishing in the game. Whether you hook a fish or not, you earn a good chunk of experience, earn 100 skill points towards fishing, and burn 100 LP per cast. This annoys me because, again, I’m gated from doing something I want to do due to labor point constrictions. I really enjoy fishing and the little mini-game you play once you hook the fish. Even if I’m not earning much off the catch (only a gold and some), considering the time it takes to land it, I’m just having fun doing it. But I have to limit my casts because it costs so much labor. 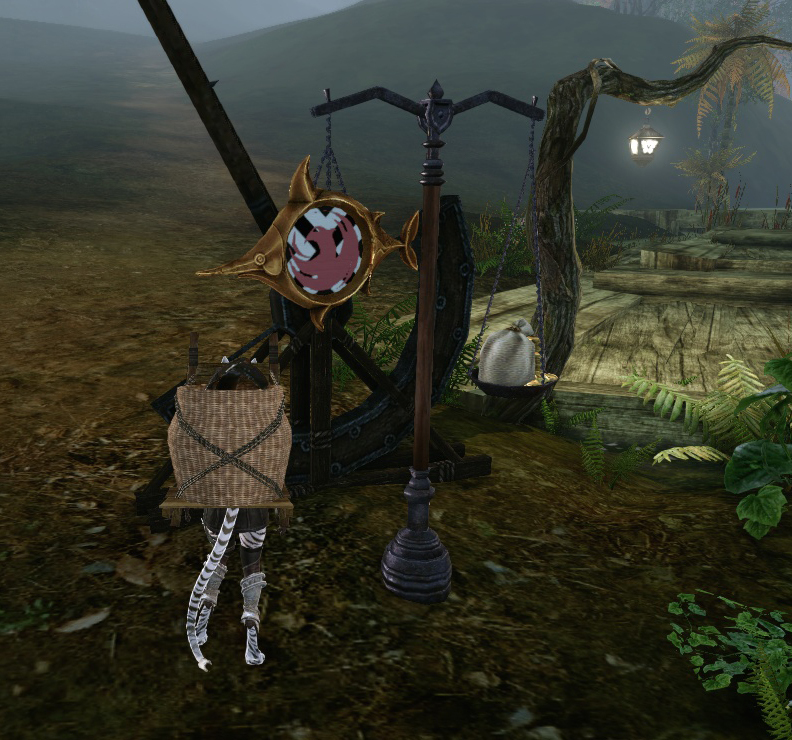 Seeing that fishing poles are also time limited once you open them, the whole system has too many frustrations, IMHO. Yes, I do know that at higher skills you can make a lot of money. But money isn’t the matter here. I just want to sports fish without having to pull up anchor after five attempts because I burned half the LP I have on hand. I hope that at higher skill, the LP burned for casts will drop significantly. I know there was a slight decrease on labor used for mining as I moved up levels. If anyone has experience with this, let me know! On a happier note, I was still able to purchase a clipper blueprint for gilda stars, even despite splurging on the aqua farm. It’s no fishing boat, but seeing that the fishing boat requires two thunderstruck trees and that I doubt I’ll be leveling fishing quickly, I decided that some boat was better than no boat. It wasn’t very hard to build in comparison to the farm house. I already had a ton of iron left over, I was able to farm up the lumber and cotton in a few days. Thankfully I had the labor built up, too, because the clipper was pretty labor intensive to craft. In the end, it was worth it. 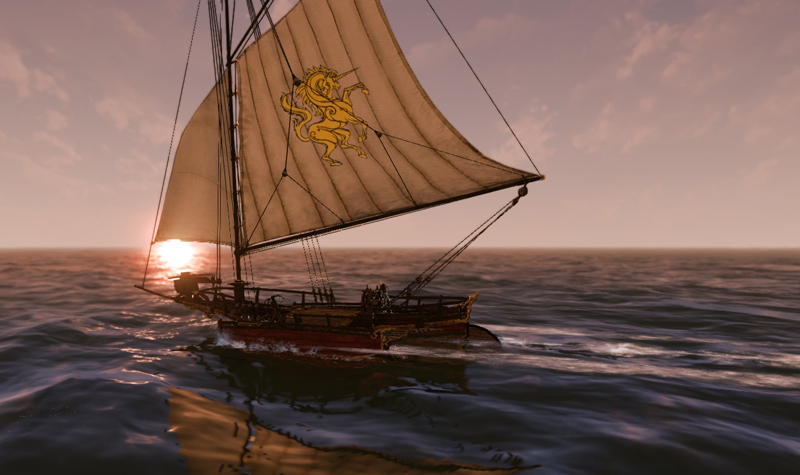 I really enjoy sailing my clipper and find it so much easier to control than the little rowboat. It’s also nicer to go out fishing on the lake in a big boat, as people out there can be very rude, running right over people who are trying to fish in rowboats. Not that it stopped a guy from rudely ramming my clipper out of the buff area… but yeah. Jerk. I’ve been learning about trade runs now that I have a farm to mass produce what I need to make the runs. I usually play it safe and do runs from Arcum or Falcorth to Lutesong. 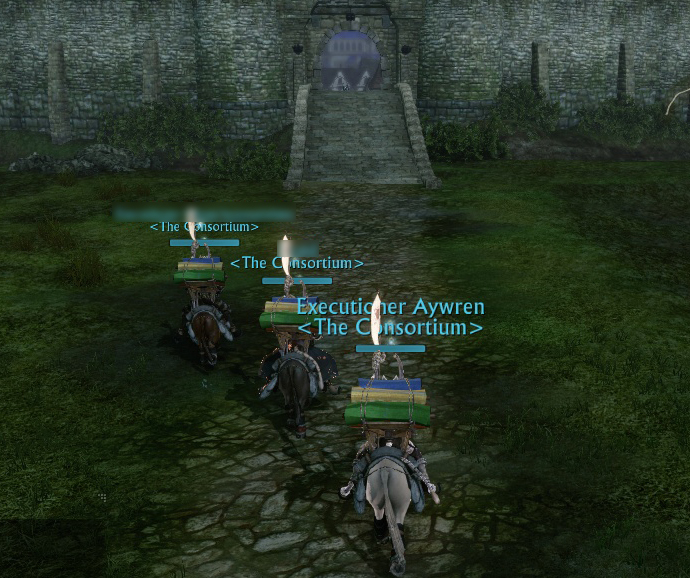 Yesterday, I was doing a normal run when I met some guildies who were waiting for the airship. They invited me to join them for a run into Yny, which was a contested zone at the moment. They told me they had a “safe” passage there, even when the zone was in conflict. I’ve not set foot into a contested PvP zone, but these guys were experienced level 50s who said they run this all the time, back and forth for good profit. We did the run without any trouble. Didn’t see a red, and had no issue with the turn in. Netted a nice 9 gold for it. Even if it was a bit stressful, it was fun to join in a guild run like that. If there’s anything I laud the open world PVP for in this game, it’s in encouraging folks to work together to get something done. If you can trust those people, safety in numbers feels really good. I’m working on gathering the materials needed for a Merchant’s Elite Cushion for my house. Having an item that provides a merchant, AH and other commodities on hand will be great. I’m raising yata at the moment, working on gathering fur and other mats. It’s the last of what I need, as I’ve already purchased the pigment and such. Sadly, it’s a rare drop, and it’s going to take some time. I’m enjoying raising animal pens and using it to raise my husbandry skills. 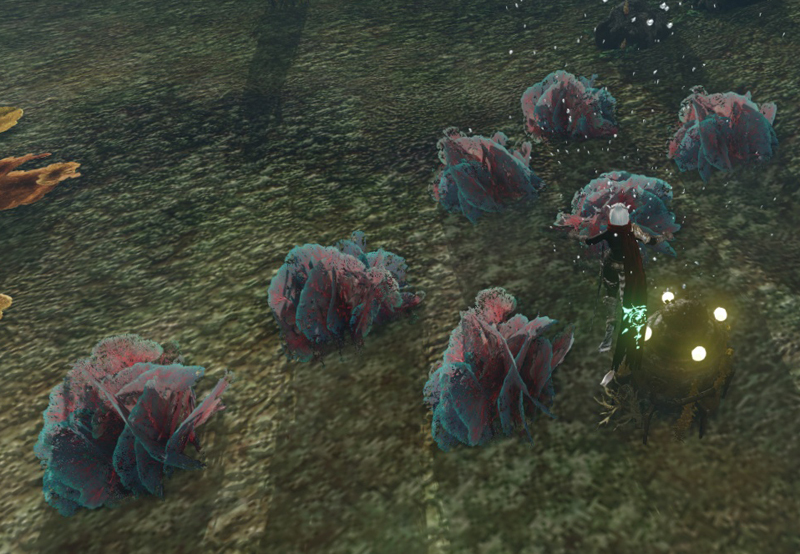 I’m also working up gathering to hopefully unlock the ability to plant seed bundles for fishing worms. Hmmm. Every time I convince myself that the LP gating isn’t a problem, you go and find another way in which it really is. I was reluctantly willing to begrudgingly accept the LP cost for regular fishing, but 100 PER CAST for sports fishing?! You put in all that time, effort and cost to create or find those chummy areas and then you can only do it maybe a dozen, two dozen times? I know, I was completely floored when I saw that pop up in my chat box after the first cast. I scrolled up and down to see if it was a mistake, but it’s not. I guess the thought is you’re gaining a LOT of fishing skill for the labor, which is true. I’m going to keep doing it on and off when I have excess labor (when is that?) and hope that a higher skill level will decrease the amount of LP needed.